Sometimes it just takes that little extra something to push us over into pulling the DNA testing trigger. That little additional nudge that says: Now. Now is the time. Go ahead. Do it. And being able to help others, particularly those so horribly impacted by Hurricane Harvey, while helping ourselves get answers to genealogical questions? Seems to The Legal Genealogist to be just the just little extra something, little additional nudge, to say go ahead… do it now. 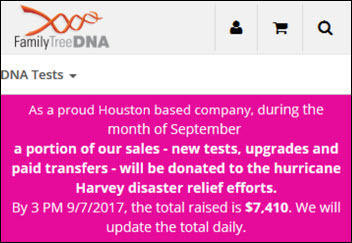 Because the one Houston-based DNA testing company — Family Tree DNA — is donating a portion of all of its September sales to Harvey relief efforts. The amount, by 3 p.m. on Friday, September 7th, had already reached $7,410… and it can only go up from there. So… what kinds of tests does Family Tree DNA do? And why would you consider testing with them? First off, this is the only genetic genealogy testing company that does all kinds of DNA tests that we can use for genealogy and provides enough information to be able to compare results to others. It offers the same autosomal DNA testing that you can get from other testing companies, with good working tools that may not be available elsewhere. That’s called the Family Finder test and the cost at Family Tree DNA is $89. But it also provides full matching results for both YDNA and mitochondrial DNA (mtDNA) — and no other company provides that level of detail. • YDNA tests provide detail on the direct paternal line — our father’s father’s father’s line — with the kind of specific information that lets us compare to others and perhaps figure out which Johnson family our Johnsons came from. • And mtDNA tests provide the same information on the direct maternal line — our mother’s mother’s mother’s line — with the kind of specific information that lets us compare to others and perhaps figure out which of two wives was the mother for our particular ancestor. Those tests are more expensive, but because they’re very targeted at specific questions, they can be very powerful and more than worth the money if they can provide the kinds of answers we can’t get in any other way. If you’ve been waiting to test, now may be the time to pull the trigger.